Less than eleven hours before Brett Kavanaugh’s confirmation hearings were set to begin—and after weeks of requests—Senators received 42,000 pages of records. That’s 42,000 pages of records to read in one night. The available documents represent at most 10% of Kavanaugh’s records. 93% of the records from Kavanaugh’s tenure as White House counsel and staff secretary remain hidden from the Senate. 96% of those records are being withheld from the public. Some Senate Democrats are asking the same thing: What are they hiding? Many Senators broached the topic of Kavanaugh’s views on presidential power, chief among them Senator Patrick Leahy. This all comes on the heels of one of Trump’s most alarming tweets yet. Over the weekend, Trump publicly criticized Attorney General Jeff Sessions for failing to protect guilty elected Republicans from prosecution. 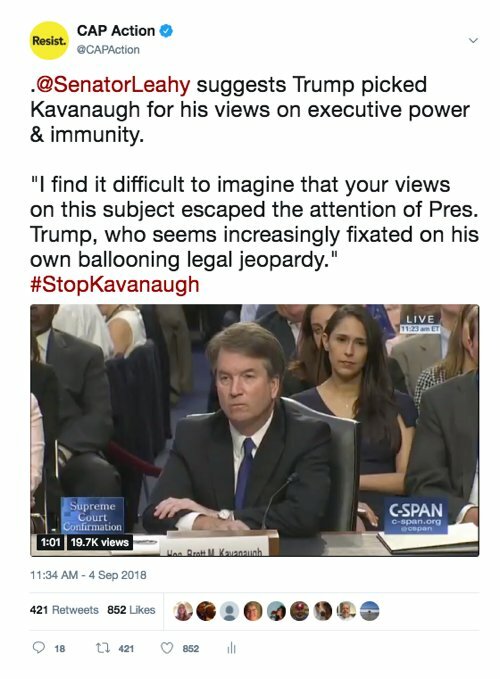 As Senator Blumenthal said in the hearing, Trump is a criminally implicated president, and he shouldn’t be able to hand-pick a Supreme Court nominee—especially with his cronies in Congress rigging the process along the way. One thing is clear: this nomination process was a sham before it began. In its latest attempt to decrease legal immigration, the Trump administration is developing another cruel policy to target immigrant families who need help. Local health providers of WIC (the federal aid nutrition program for pregnant women and children) have reported receiving calls from immigrants of both statuses asking to be purged from their roles out of fear, and at least 18 states have reported up to 20% decreases in WIC enrollment. Immigrant workers open small businesses, provide health care services, and work in locally important sectors such as meatpacking plants, small manufacturers, and farms. Integrating immigrants into rural communities bolsters economic growth for everyone. In cruelly discouraging immigrants from seeking crucial benefits for fear of reprisal, Trump is fulfilling his anti-immigrant campaign promises—and having a chilling effect on the immigrant community. The impact of this policy will be felt far and wide—even in rural communities who are benefitting from their immigrant residents.